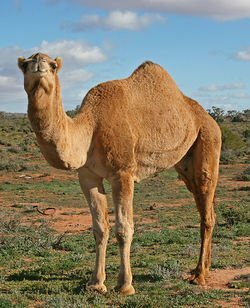 A new research suggests that dromedary camels could be responsible for passing to humans the deadly MERS coronavirus that emerged last year. Tests have shown the MERS (Middle East Respiratory Syndrome) virus, or one that is very closely related, has been circulating in the animals, offering a potential route for the spread. The study is published in the journal Lancet Infectious Diseases. But the scientists say more research is needed to confirm the findings. The MERS coronavirus first emerged in the Middle East last year. So far, there have been 94 confirmed cases and 46 deaths. While there has been evidence of the virus spreading between humans, most cases are thought to have been caused by contact with an animal. But until now, scientists have struggled to work out which one. To investigate, an international team looked at blood samples taken from livestock animals, including camels, sheep, goats and cows, from a number of different countries. They tested them for antibodies – the proteins produced to fight infections – which can remain in the blood long after a virus has gone. The team found low levels of antibodies in 15 out of 105 camels from the Canary Islands and high levels in each of the 50 camels tested in Oman, suggesting the virus was circulating more recently. “Antibodies point to exposure at some time in the life of those animals,” Prof. Marion Koopmans explained. No human cases of the MERS virus have been reported in Oman or the Canary Islands, and the researchers say they now need to test more widely to see if the infection is present elsewhere. This would include taking samples from camels in Saudi Arabia, the country where the virus is the most prevalent. Health officials say confirming where the virus comes from is important, but then understanding how humans get infected is a priority. Data suggests that it is not yet infectious enough to pose a global threat and is still at a stage where its spread could be halted.